Most of the stories in this book are about how you can change what’s on the inside of the experience you offer. How you can build more doors into it. 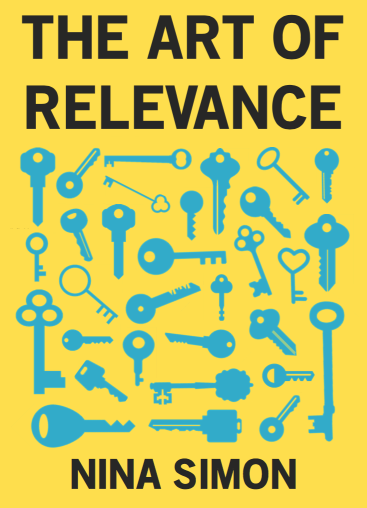 How you can work with new participants to reshape your room to be more relevant to them. But the most direct way to be relevant has nothing to do with what’s inside your room. The most direct way is to go outside, personally and institutionally, to learn from the other rooms and people out there. Going outside helps you empathize with the challenges of being an outsider. It helps you identify the doors that others are offering into their own experiences. If you are trying to understand how to build a door for a particular community, the best way to do it is to see what kind of doors that community willingly, joyfully walks into in other contexts. You won’t learn what’s relevant to them on your turf. You have to do it on theirs. Of course, to do this, you have to find a door into their world. You can do this by asking a trusted leader in that community if you can shadow her. You can do this by finding out about opportunities to volunteer at other communities’ events. Or you can just show up, as a participant-observer, and see what you can learn from the experience at hand. One of the first things you’ll learn as a participant-observer is how uncomfortable it can feel to be an outsider. Embrace this discomfort. It builds empathy. Architects talk about the idea of “threshold fear”—the discomfort people have when walking into certain kinds of buildings. Think about how it feels when you walk into a bank, a library, or a tattoo studio. Each of these has a different threshold. In each case, you are walking into a different environment, a different culture, a different room. The experience of the threshold is not strictly one of architecture; it is also impacted by what kind of people you see (security guards? people like you?) and the energy in the room. Walking through a threshold into a bustling shop feels very different than walking in as its only customer. You may not always feel “fear” when passing through an unfamiliar door, but you likely feel some discomfort. Until you can identify whether you belong in the room, your guard is up. You may start adopting the behaviors of people in the room—consciously or unconsciously—to blend in more easily. You walk with a bit more swagger. You lower your voice. You stay on guard. And then hopefully, someone welcomes you. You hear a favorite song over the speakers. You see someone who looks like you. You start to relax. You start to feel like there is space for you in this room. For many insiders—especially professionals—it sounds unbelievable that people would experience threshold fear in museums or theaters, synagogues or parks. How could a person possibly feel intimidated, truly frightened, of entering a museum? How scary or confusing could it be? We can’t fathom that kind of fear, and so we demean or disregard it. Don’t disregard it. Try it. Go to an institution that makes you uncomfortable—a place you would never go willingly. Go to a boxing gym. Go to an uber-hip bar. Go to a place of worship that is not your own. Find a place where you feel an urge to bolt out the door the minute you walk in. Go there alone. See what makes sense and doesn’t to you. Consider what intimidates you and what you feel comfortable with. Note the people, areas, or experiences you gravitate to as safe starting points. If you find yourself resisting going to that bar or mosque, you’re not alone. This is why so many of us stay in the swim lane of what’s familiar to us. We don’t seek out things that might be relevant but engender too much stress, effort, or uncertainty. If you feel that way about entering a particular community, folks in that community may feel the same way about coming to yours. The first step to being an open-hearted insider is feeling empathy for outsiders and their experiences.